Post Road runs through the most affluent neighbourhood in Canada and ends in it’s first planned community. Between the two, the road is broken by Wilket Creek where there is no bridge crossing. I had time for a short hike while my wife was sleeping off a stomach illness. At the start of the 20th century the area of Bayview and Lawrence was becoming home to some of Toronto’s wealthiest people. They started to build grand estates complete with horse stables for their riding pleasure. We previously looked at some of these old homes in Bayview Estates. In 1929 the bridge over the West Don River at Lawrence Avenue was rebuilt but the area north of it was still rolling farm land. The area we now call The Bridle Path was marked by horse trails and was seen as a good place for an exclusive enclave of grand homes because of it’s limited road access. In 1937 E. P. Taylor, who had designed Canada’s first planned community in Don Mills, bought a large plot of land north of the Bridle Path for his estate. His wife named it Windfields and today it is owned by the Canadian Film Centre. The park behind the estate is known as Windfields park. George Black was partners with Taylor and he built the home on Park Lane Circle where he raised Conrad Black. To keep the neighbourhood to the wealthy a North York by-law was passed requiring single family homes on a minimum two acre lot size. The streets in the neighbourhood take their names from horse racing and Post Road is the most northerly road in the Bridle Path and thus represents the post position, or starting position for the community. 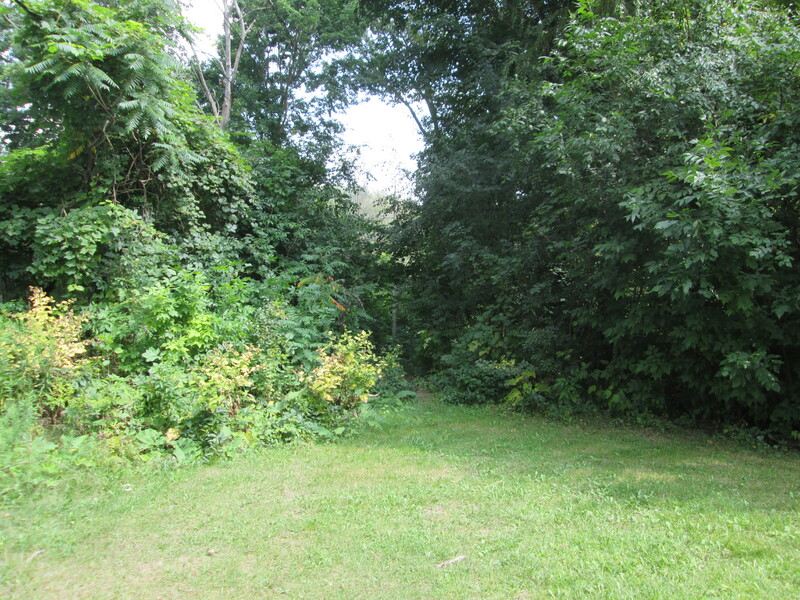 Post road runs for about 700 metres east from Bayview Avenue through an area where there are only half a dozen homes. This picture looks from where the paved portion of Post Road ends, east toward Wilket Creek. You can park here for free. 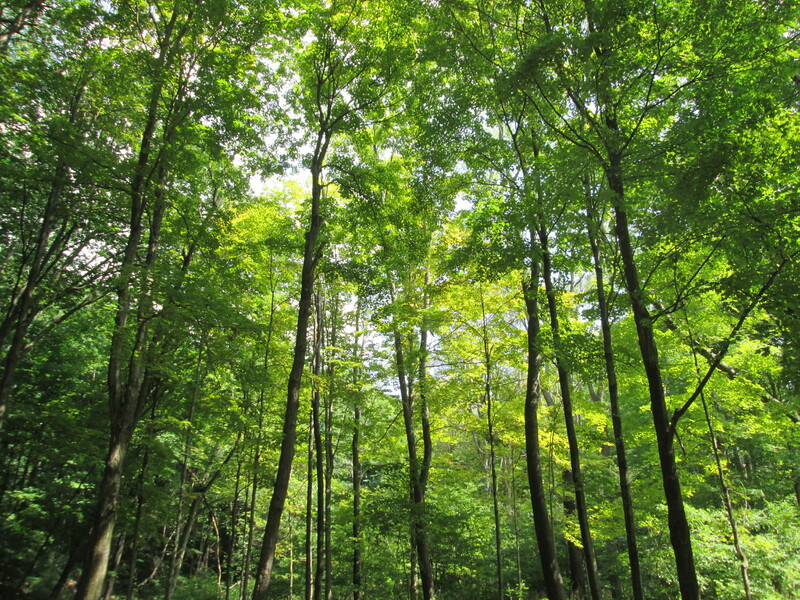 The cover photo is taken from part way down the old roadway where a hydro line is visible passing through the new growth. There is only a little trail left of the roadway where it descends the hill toward the creek. As is common with many closed portions of road there is always someone who thinks they should be used as dumps. The west end of Post Road has it’s little caches of trashes. I found a vinegar bottle from 1958 indicating that the trash was dumped after the development of the area had been well under way. 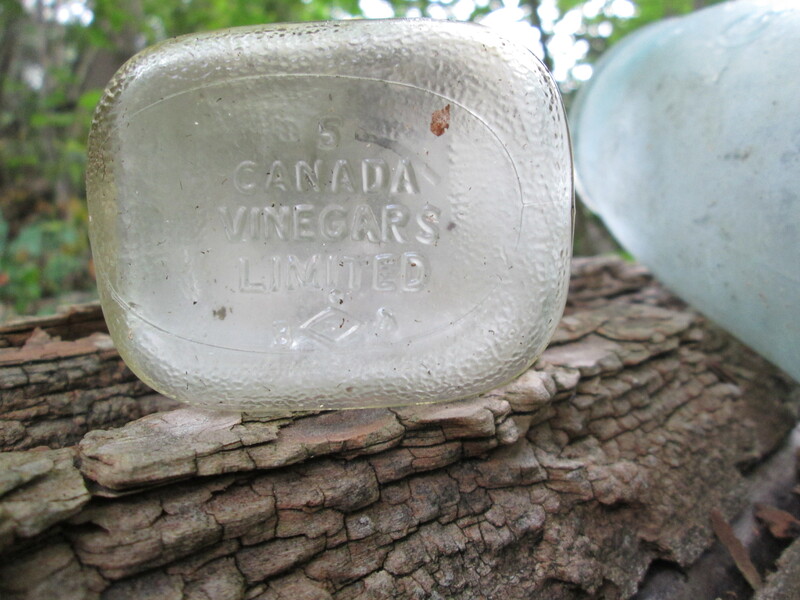 Canada Vinegars Limited was once the largest manufacturer of vinegar in North America. They were located at 112 Duke street (now Adelaide) not to far from Toronto’s first post office. At the bottom of the hill there is no sign of any bridge remains. Aerial photos from 1947 show the roadway but there was already no bridge here at that time. This picture looks north up the creek bed. On the left side there is a sewer access dated 1980 indicating that the overgrowth on the roadway is only 35 years old because heavy equipment was through here at that time. 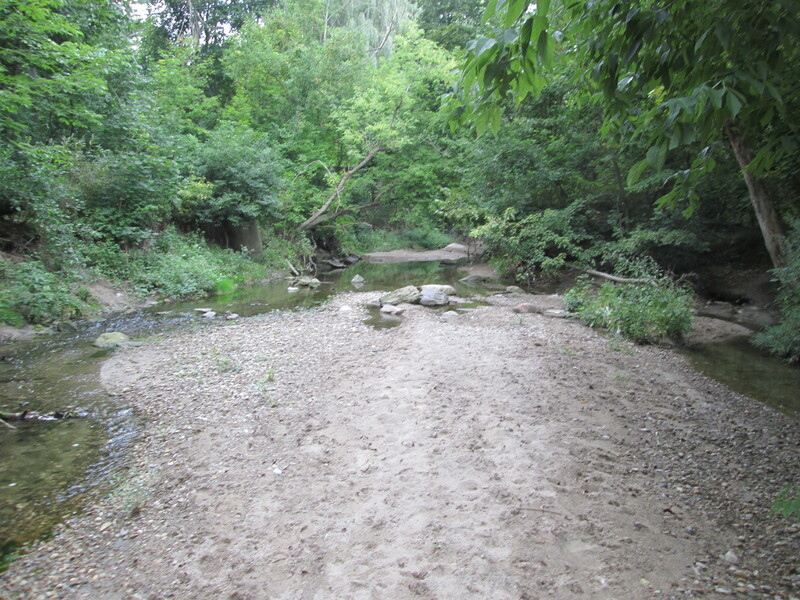 With the water level very low in the creek I was able to cross onto the east side. The trail on this side is much more open and well used. It appears that lacking personal gyms and pools for exercise, the inhabitants of the poorer side of Post Road resort to using the park more than their rich counterparts on the other end of the road. There are signs of former activity along Wilket Creek as you make your way north along the waterway. 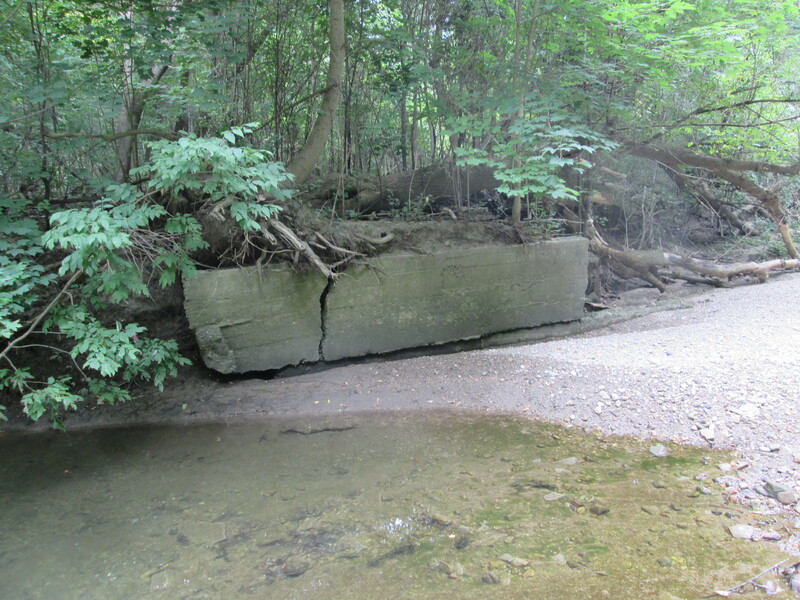 There are several concrete formations that may have been related to mill dams or possibly to flood control. 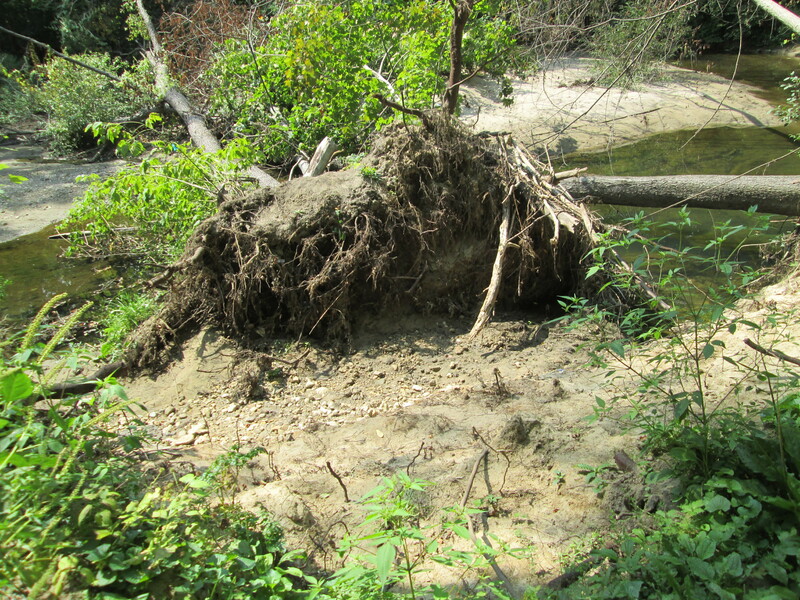 The creek bed and surrounding flood plains are composed of a lot of sand and the sides of the creek are in constant erosion. There are fallen trees all along the creek including this one which has fallen over but continues to have green leaves on it. Goldenrod is starting to come into it’s bright golden flowers. These flowers are essential to the bug community and you will see a wide variety of bees, beetles and assorted other insects on them. This example is playing host to a colony of ebony bugs. Much of the floodplain for Wilket Creek is filled with new growth trees and is a quiet area to hike where I saw very little wildlife. 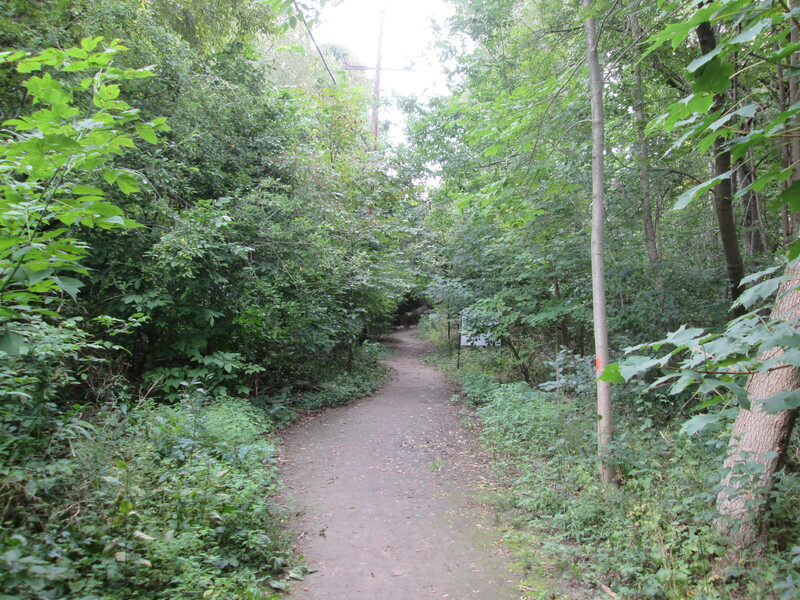 The trail leads to Banbury Park and Windfields Park. Post Road is split in the middle by Wilket Creek and there is no bridge to link the wealthiest properties on the west side with the planned community of Don Mills on the east side. You stay on your side, and I’ll stay on mine! Our top 15 stories as selected by readers. 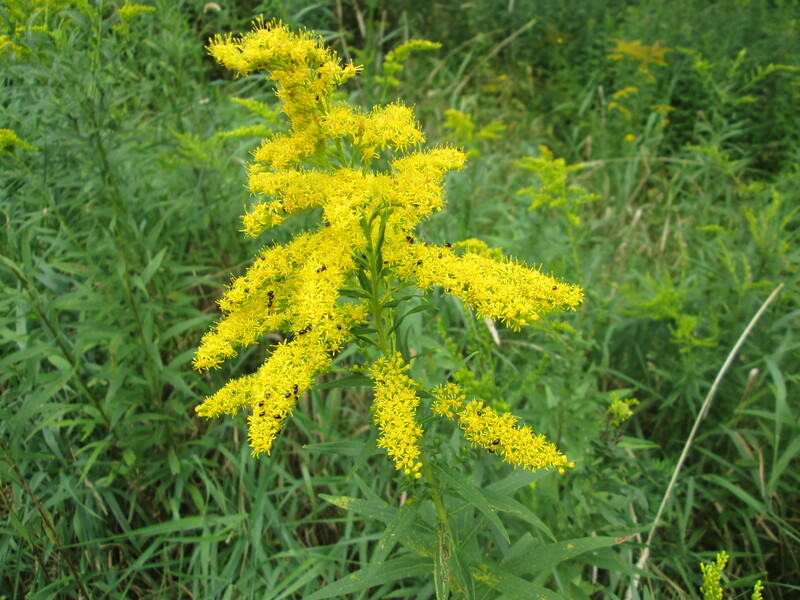 This entry was posted in Don River and tagged Canada Vinegar Company, Don River, ebony bug, goldenrod, Post road, Wilket Creek on September 2, 2015 by hikingthegta.